Develop new ways of conquering them. The purpose is to discover, resolve, and act. Are some people more likely to take courageous steps forward after a coaching engagement? 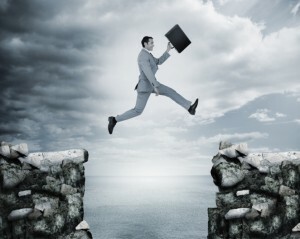 With other things being equal (e.g., a trusting connection with a coach, a clear sense of the problem, and a sound strategy for addressing the situation), why do some people leap forward while others hesitate? What can be done about it? An inherent aspect of any specific executive coaching goals is to help a coachee face their challenges and develop a plan of action to overcome them. Experience. If an individual is a veteran problem-solver, a new situation is just going to be something with which they have to deal. Conversely, if this is the first time that an individual encounters a significant challenge at this level, then dealing with the situation can be more problematic. Experiences may guide us toward solutions, but it is just as important to muster the courage to carry out a difficult action. Self-talk, such as, “This too shall pass,” is not productive, even when we have the necessary tools to deal with tough issues. Often confused with empathy, sympathy can creep in when we are under stress, emotionally stopping us in our tracks. Personality. Some personality types may have more difficulty taking action when other people will be affected by change. For instance, if a coachee has to deliver bad news to an employee, it can be a tremendous stumbling block. This person knows what has to be done and knows what action needs to be taken, but he does not want to negatively affect another individual — even at the risk of putting the entire organization at risk. From time to time as a coach, I may believe that an already discussed situation is going to be handled, only to discover at the next session that nothing has been done! It’s important to discover what is getting in the way. Was this person held back by doubt, inexperience, or other blocks? Was their procrastination borne of fear or a lack of confidence? Do personality traits render this person powerless to impact anyone else? I know of no self-correcting problems. It is crucial for the coachee to take the necessary action steps, and then implement the plan. Easier said than done, the courage needed can take all the strength a coachee can assemble. As difficult as it gets, the very survival of an organization could depend on it, and this is where a coach can help. Usually, it’s not a fault of strategy but one of courage that is getting in the way. Given the circumstances, we will review the plan and determine what is required to implement it. From this point, I will look for a new resolve to complete the task. Working with a coach can help you develop the courage you need to tackle your most pressing challenges and issues. Knowing what to do is only the first step; having the wherewithal to follow through and utilize the support of an executive coach ensures that you make tremendous strides forward.